These few short years that began Spurgeon’s long London ministry (1854-1892) were nothing short of amazing. Spurgeon came to London as a stranger to the large city, looking much like a “country bumpkin” even to Susanna who would soon become his bride. Spurgeon and the people, however, quickly adapted to one another. Soon the New Park Street Chapel couldn’t hold the 2000 people who came to every service to hear the “boy-preacher.” By February, 1855, services would be held in the Exeter Hall while renovations were being made to the church. By October, 1856, services had to be moved to Surrey Garden Music Hall which could seat 12,000 people. That was filled every service. Spurgeon was invited to speak at a special service at the Crystal Palace in October, 1857 which 23,654 people attended. Already plans were being made to move the church to a new location. Spurgeon chose the intersection of Elephant and Castle, a prominent location in south London, and also the site of Anabaptist martyrdom from the 16th century. The Tabernacle would be completed by August, 1860. It formally seated 6000 but often 10,000 attended. 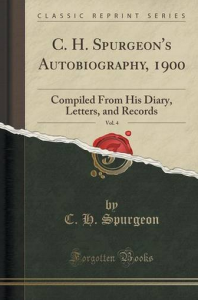 This second volume (of four) also includes the history of criticism that Spurgeon received in those early days, the courtship with Susanna, the homes they lived in, the building of the Tabernacle, and the early beginnings of what would later become the Downgrade Controversy.